Milan, the city model for the financial sector in Italy is the second largest city in the country after Rome. It has an important position being the capital of the Province of Milan and the Lombardy Region. While Rome is the administrative capital of Italy, Milan makes its presence felt in many sectors of the economy, especially in the fashion world. Along with the impressive names in Paris, New York and London, Milan is listed as one of the world's fashion capitals. Here lies the heart of the financial centre of Italy with the National Stock Exchange and its urban look makes your head spin just like the other Italian cities. The fashion shows, the nightlife, the excellent Italian food and the metropolitan area offer the futuristic perspective of a country which attracts many young people. In addition, Milan is the ideal starting point for exploring the tourist cities of Northern Italy, including the Alps. Milan could be seen as an expensive destination but in reality there are plenty of places in town where you can drink a cup of coffee at a low price. In addition, it is not just a location for Fashion Week but it also hosts many museums, churches and theatres providing an important piece of the history of Italy. And there are plenty of natural scenery like the horizon of mountains or parks for romantic evening strolls. 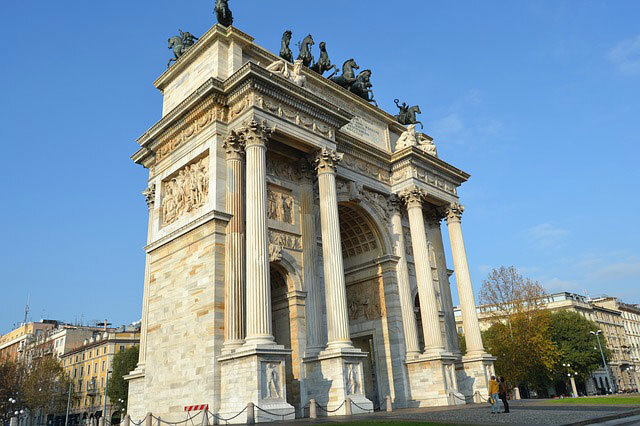 Milan is the socio-economic capital of Italy and a trip to this wonderful city will always be a welcoming experience as well as the friendly and helpful locals. Good manners, courtesy and knowledge of some useful expression in Italian, for the foreigners, will open all the doors to the exploration of the city. Not to be missed is a visit to the Duomo, the symbol of Milan and the fourth largest Gothic cathedral in Europe, whose construction took five centuries of work. Another landmark is the Teatro alla Scala, the largest opera house in the world. Built in 1776, along with the theatre, it also houses the Theatre Museum and the Ballet School of the Teatro alla Scala. Not to be missed for fans of football, however, is the San Siro Stadium, opened in 1926, which currently has a capacity of over 85,000 visitors. Milan is a tourist destination all year round. Depending on the climatic zone of origin, you might prefer the hot summer months rather than colder winters but for the majority of tourists each period is right to have fun. The winters in Milan are not so terrible and can be ideal for those tourists used to both cold temperate zones and warmer areas being the temperatures quite bearable. Bringing sweaters and jackets if you are traveling in winter it is a good idea in case you are not accustomed to European winters. After arriving at the Linate Airport, you may need information about local tour guides, hotels, cultural events and attractions. In this case, there are several tourist information offices scattered throughout the city. Tourist Information Office (IAT) and Tourist Promotion Office are the official tourist offices. From the city of Milan, the locations to visit are so many. Milan, in particular, always catches the attention because it is one of the most important cities of Europe at the cultural level, able to get such a reputation for several interesting aspects from the art world to the booming fashion industry. A visit to this city is a must: strolling through its streets will open you to a world full of entertainment, streets full of shops, bars, restaurants, clubs and a million other activities that are designed to push you in the heart of a really glamorous holiday. For these reasons, it has become one of the tourist destinations most visited by foreigners and it is among the most economically prosperous. If you have thought of going there, now it is the time to take advantage of car hire milan linate for an experience you'll never forget.